Looking for the perfect, tailor-made itinerary that will allow you to experience an epic wildlife and wilderness holiday in British Columbia? Our insider knowledge takes out all the guess work, and we can even book this completely bespoke self-drive itinerary for you – all you have to do is go and enjoy it. Begin your trip by flying into Vancouver International Airport (YVR), just a short drive from the city itself, a place with laid-back charm where the ocean meets soaring mountains and is filled with picturesque parks, forests, world-class restaurants and shops, as well as boasting an exciting nightlife. One of the world’s truly great cities is also home to multiple top-notch hotels, like the Fairmont Pacific Rim. Set right in the heart of downtown, you’ll have easy access to a wealth of attractions and many of the city’s very best hotspots, while enjoying spectacular views overlooking the harbour and the mountains beyond. Start your exploration of Vancouver with a visit to Stanley Park, only minutes from downtown, just north of the West End. 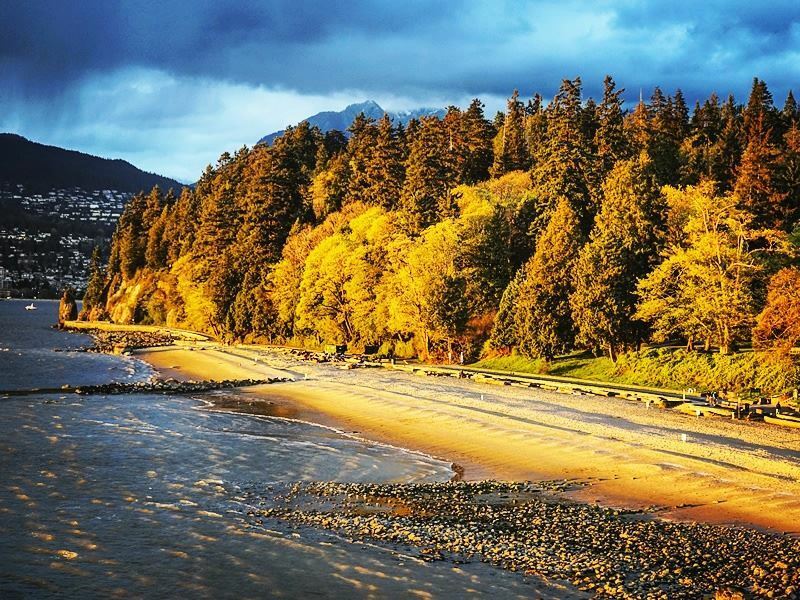 One of the most popular attractions with locals as well as tourists, the 1,000-acre park features a 5.5-mile-long seawall that hugs the waterfront, providing views of the North Shore Mountains, downtown Vancouver, Burrard Inlet and Lions Gate Bridge. Walk or bike it, and you’ll also discover a number of interesting landmarks along the way, like the mermaid sculpture, “Girl in a Westsuit,” and the 32 million years old Siwash Rock, rising from the water. The park’s lush tree-filled interior offers a wealth of scenic trails for exploring, and the park is also home to the largest aquarium in Canada, a waterpark, a heated outdoor swimming pool, and a miniature railway that winds through more than a mile of forest. You could easily spend more than a day here and not see it all. 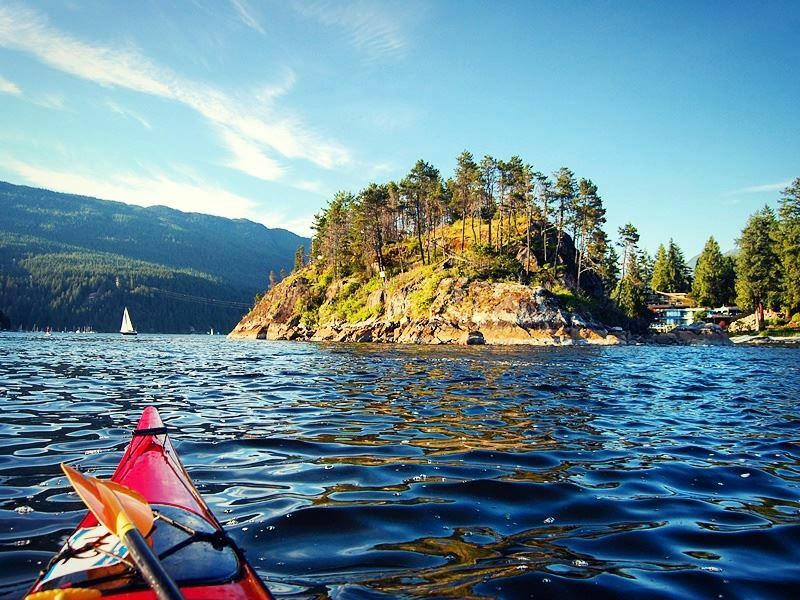 Deep Cove is also well-worth a visit, situated just 30 minutes from downtown Vancouver at the head of Burrard Inlet, where you’ll discover a peaceful community and a tranquil harbour view. Enjoy relaxing on the beach and gazing out at the water, or hiking one of the myriad of scenic trails like the Quarry Rock Trail This relatively short jaunt is just a little over a mile each way, but brings gorgeous views over Indian Arm and the mountains around Belcarra. You can also wander the commercial core of the community, a two-block stretch of Gallant Avenue, lined with galleries, boutiques, bistros, cafes and a local theatre. 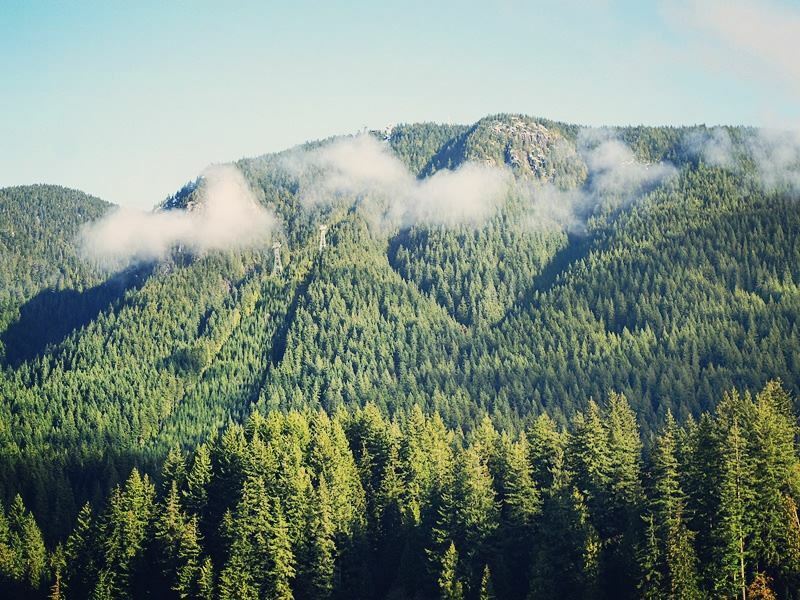 Venturing to Grouse Mountain really is a must – it towers over North Vancouver, and not only offers jaw-dropping views from its summit, but it provides a wealth of opportunities for outdoor adventure, just a 20-minute drive from downtown. This wilderness paradise is home to ziplines, a wildlife refuge and the Grouse Grind, AKA Mother Nature’s Stairmaster. The trail includes 2,830 steps, stretching for about two miles, and will definitely get your heart pumping. It takes an average of 90 to 120 minutes to complete, though the official course record for men is 25:01, and for women, 30:52. If relaxing and enjoying those views is more what you had in mind, hop on the Grouse Mountain Skyride for a one-mile aerial journey to Alpine Station, sitting at 3,700 feet above sea level. From there, you’ll be able to look over the city, the surrounding mountains and the sea. One of the most popular, and oldest, attractions in Vancouver is just five minutes from Grouse Mountain. Capilano Suspension Bridge Park is a 27-acre park filled with giant old-growth trees draped with moss and centres around a suspended bridge. 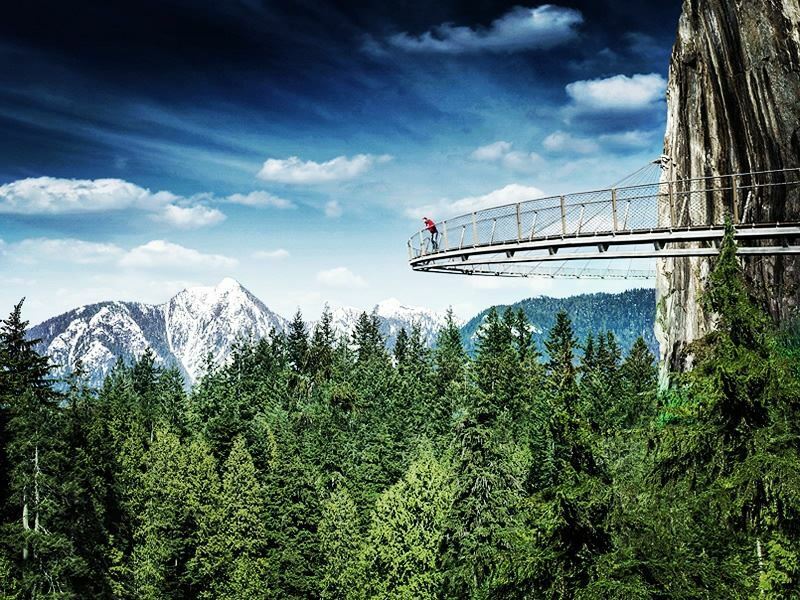 The bridge was originally built in 1889, and dangles 230 feet above the dazzling, emerald-hued Capilano River. It spans for 450 feet, providing the opportunity for a bit of a hair-raising adventure, and a spectacular perspective of nature. If you can brave the dizzying heights and get to the other side, you’ll find a number of other activities as well, like the Cliffwalk that meanders alongside the edge of a canyon. It follows a granite precipice along the river on a labyrinth-like series of cantilevered bridges, platforms and narrow stairs. While you’re here, you can also delve into the interesting culture and history of the First Nations people at the Story Centre and the Kiapalano Cultural Centre. Next it’s time to venture to the capital of British Columbia, located on Vancouver Island. Victoria is one of Canada’s most picturesque cities, home to the world-famous Butchart Gardens and boasting both mountain and ocean vistas. 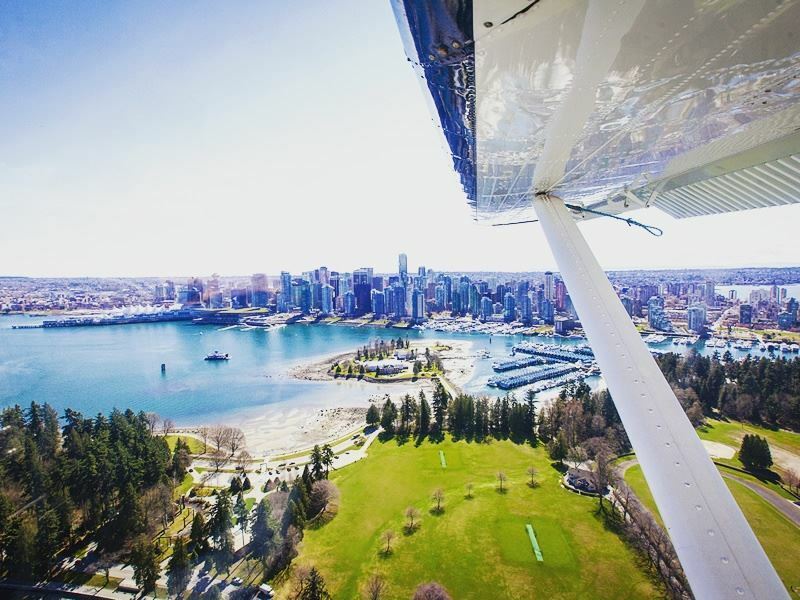 Get here by hopping on a float plane to Victoria Harbour to experience the incredible views en-route. 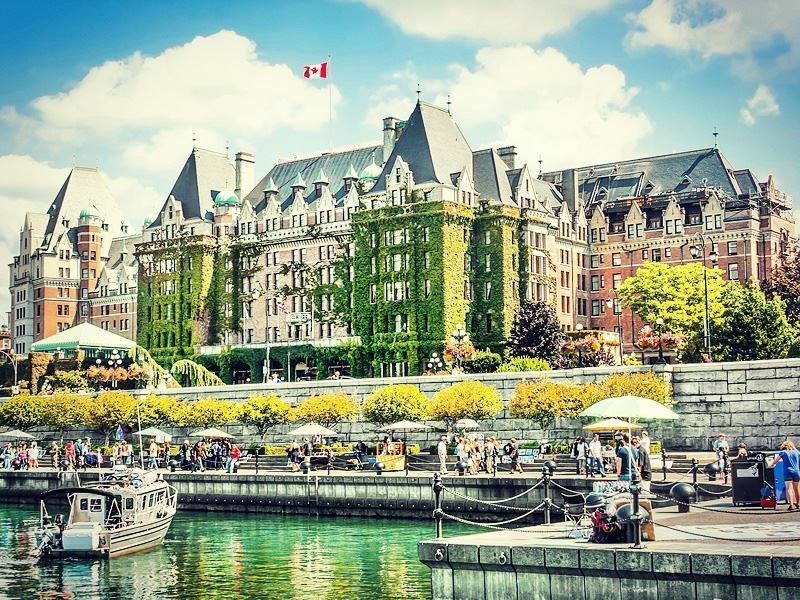 As you’ll want to spend a couple of days here, base yourself at the highly-rated Fairmont Empress hotel, which enjoys a beautiful, romantic setting on the banks of the Inner Harbour. Soak up the bay views and historical charms for a taste of what Victoria was like when the hotel opened over a century ago, along with luxurious amenities like the lavish spa and the acclaimed Empress & Q Bar. In the summer, you can take advantage of its Afternoon Tea service, something that attracts guests from across the globe. Explore the city’s sights by horse-drawn carriage, and be sure to make time for a whale watching tour, as this is one of the world’s premier spots for whales. There are a number of outfitters offering these excursions that include the opportunity to view majestic Resident orcas as well as migrating humpback whales. Many tours guarantee sightings during the peak season, from mid-May through the end of October, so if by the odd chance they aren’t spotted, you’ll be invited back for free. Afterward, enjoy waterfront dining in the evening at the Inner Harbour. You’ll need a good five to six hours to drive the Scenic Marine Route which follows the Trans-Canada Highway, including multiple stops along the way. Travel it counter-clockwise, stopping at the BC Forest Discovery Centre in Duncan to take a stroll on the marsh and forest trails through the open-air museum. At Lake Cowichan, the island’s second largest lake, enjoy a refreshingly cool dip in the water or explore one of the hiking trails. Port Renfrew offers some stunning hikes along the Juan de Fuca Marine Trail, which follows the coast of the island and provides the chance to spot sea lions, bald eagles and whales. Leave enough room in your schedule for a visit to Butchart Gardens too. One of the world’s most magnificent gardens, its striking natural beauty will literally take your breath away. The 22-hectare tract features 700 varieties of plants in bloom from March to October. At Goldstream Provincial Park, you can check out Niagara Falls – while not as large as the more famous Niagara Falls in New York and Ontario, it’s still an impressive sight, plunging for more than 150 feet. A short trek will bring you to the canyon, where you can see the water cascade over the rocks from high above. If you have the time, you may wish to extend your stay on the island for the opportunity to explore more of its amazing destinations, including Tofino and Pacific Rim National Park. 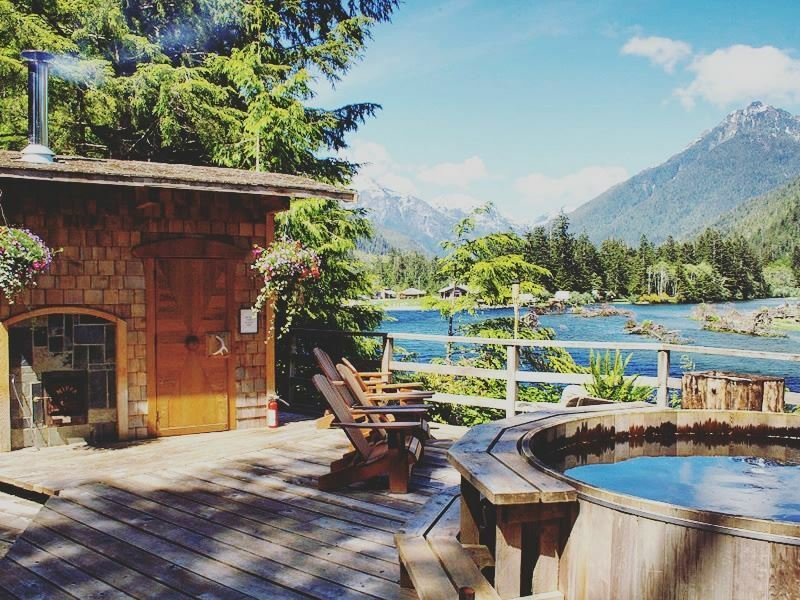 The Clayoquot Wilderness Resort makes for a stay of a lifetime, set on a secluded coastal stretch of the island. It can only be accessed by floatplane or boat – from Tofino, it’s a simple 30-minute boat transfer. You’ll fly over islands, dramatic mountain peaks and glaciers, to get to this place that’s surrounded by thousands of acres of lush, unspoiled rainforest, and is home to far more eagles, bears and whales than humans. Stay in luxurious white canvas tents for a true “glamping” experience, and indulge in services at the tented spa as well as a host of activities, including wildlife viewing, fishing, kayaking, horseback riding and more. 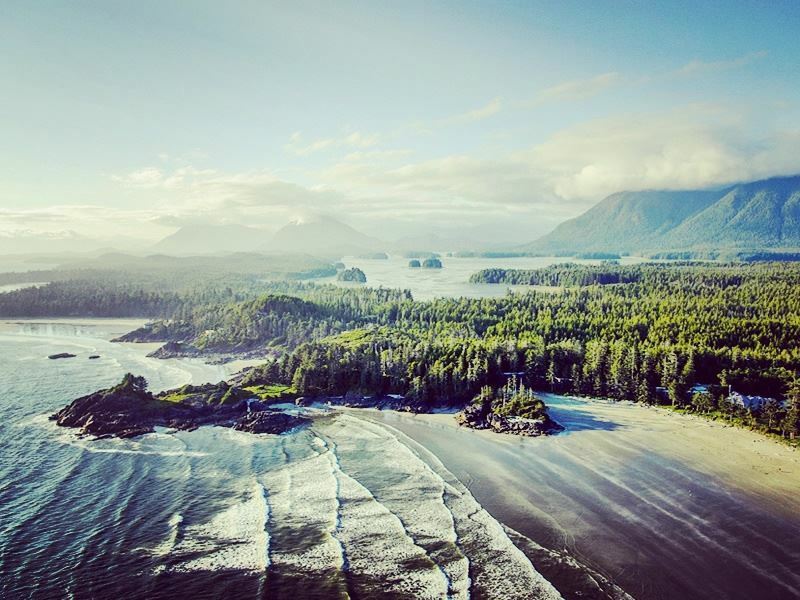 The village of Tofino sits in Pacific Rim National Park, and has lots to offer too, including a variety of hikes through dense temperate rainforest and wild, remote beaches that are ideal for strolling while soaking up Pacific Ocean views and watching for whales. Head north to Port Hardy, a community known as a jumping point for all sorts of wilderness adventures. 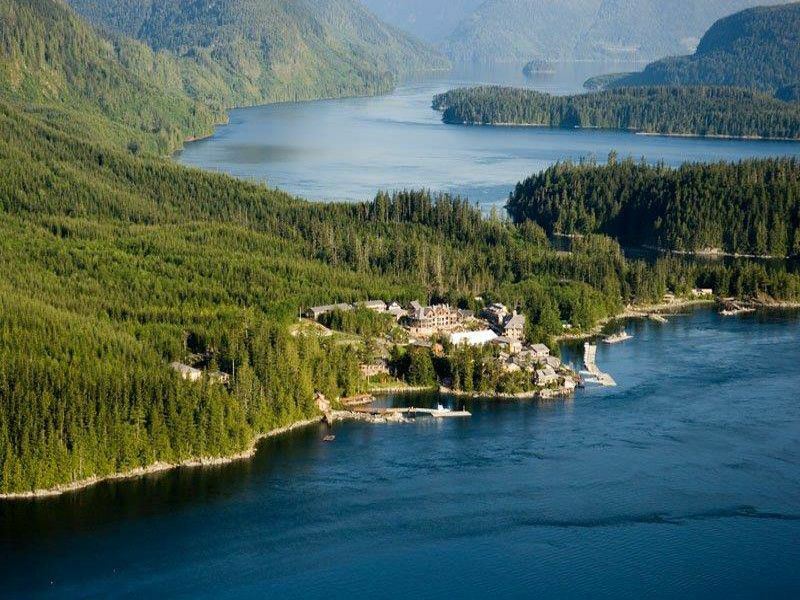 From here, you can hop on a seaplane for an unforgettable stay at Great Bear Lodge, one of the best spots on the planet for viewing grizzly bears. Biologist guides lead guests on tours that include close encounters with the bears and other native wildlife. The Discovery Islands, located off Vancouver Island’s east coast, are also worth exploring, with numerous beautiful beaches, scenic trails and the chance to get out on the water to view all sorts of marine creatures like dolphins, whales, porpoise, seals, sea lions, starfish and more. Sonora Island, part of the Discovery Islands, is home to Sonora Resort, where you’ll have easy access to all of this and more. It’s a great place to relax and enjoy luxuries like a mouth-watering menu, fly fishing ponds, a putting green, swimming pool, hiking and biking trails, wildlife outings and a wide range of indulgent treatments at its Island Currents Spa. Heading back to the mainland, your first stop is the town of Kelowna, located in the heart of Okanagan Valley, famous for its hybrid and fruit wines, and Okanagan Lake, with its countless sandy beaches. Get out on the water by renting a kayak or boat at the marina, or simply relax with a good book on the sand. Kelowna has three distinct winemaking regions, five wine trails and over 30 wineries for tasting and touring as well. 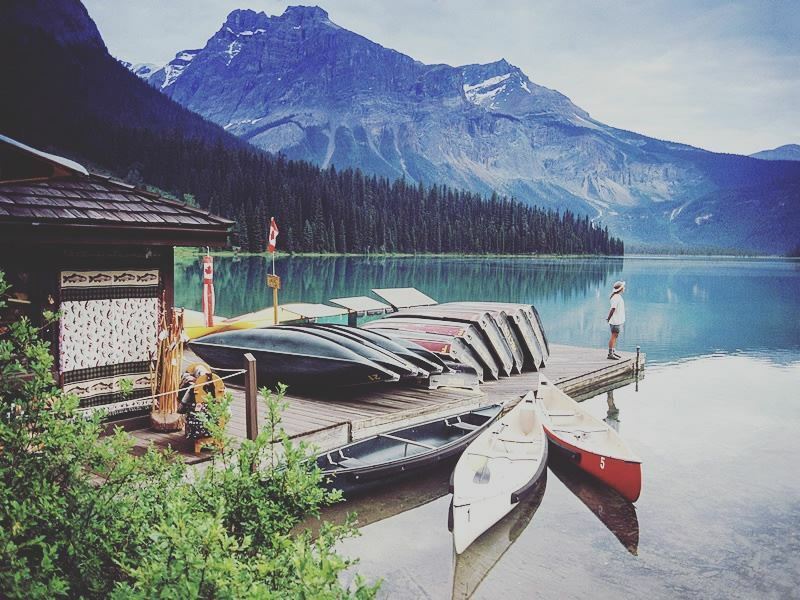 From here, take a scenic road trip to Yoho National Park, where you can stay at the beautiful Emerald Lake Lodge. This picturesque waterside retreat sits across 13 acres, and is dotted with two dozen warm, inviting cabin-style accommodations that include wood burning fireplaces and balconies, all set against a stunning wilderness backdrop. Hiking, fishing and mountain biking can be accessed on the property, as well as in the park, less than a 30-minute drive away. Yoho was aptly named for a Cree expression of “awe and wonder.” It boasts towering rock walls, vast glaciers, glorious waterfalls and multiple rocky mountain peaks. A true hiker’s paradise, you’ll find treks of all types, from short impressive strolls around Emerald Lake and to Wapta Falls to routes where you can discover half-a-billion year-old fossils in the Burgess Shale fossil beds, as well as multi-day adventures, which might have you planning a return trip. From Yoho, journey to Kamloops for some pony trekking. Campbell Hills Guest Ranch offers horse riding in the mountainous terrain, through alpine meadows where you can watch for unique birds while taking up the beautiful views. The ranch offers other activities too, including wildlife viewing, hiking, mountain biking, four-wheeling, fishing, campfires and wagon rides. For guaranteed wildlife sightings, visit the British Columbia Wildlife Park, located in Kamloops. Visitors can learn about and experience close encounters with animals like Arctic wolf, elk, moose, Rocky Mountain bighorn sheep, cougar, lynx, the rare Kermode bear, grizzly and black bear, birds of prey and much more. Whistler is the final stop before returning to Vancouver. The site of many of 2010’s Winter Olympic Games, it offers a wealth of warm weather adventures too, along with a pedestrian-only village, down-to-earth mountain culture and breathtaking scenery. 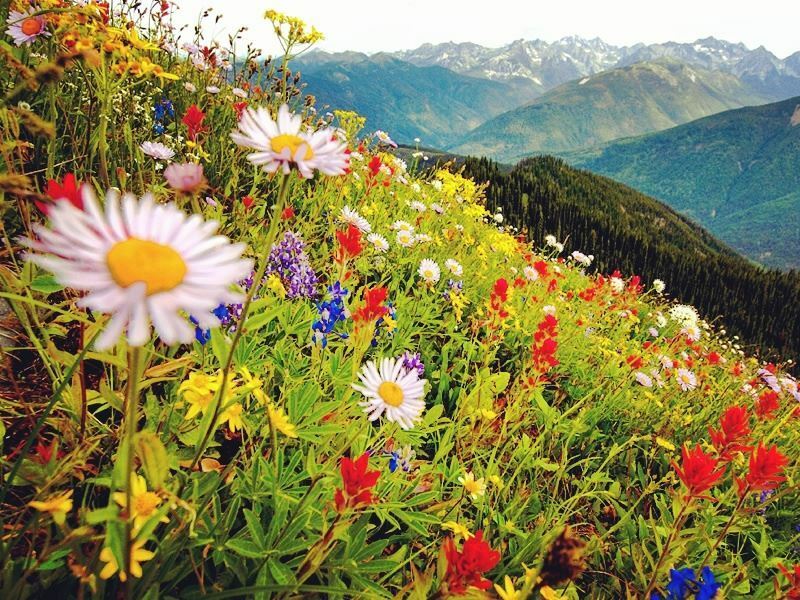 In the summer, after the snow has melted off those soaring mountain slopes, it’s transformed into one of the world’s best places for hiking, with so many trails it would take nearly a lifetime to explore them all. Many are easily accessible right from the village, with everything from short treks through old-growth forest and waterfalls to more challenging all-day hikes into high alpine areas. Garibaldi Lake is one of the best options, a moderately challenging 5.6-mile hike that features this gem-like lake with its water one of the most brilliant turquoise shades you’ll ever lay eyes on. Whistler visitors will find an array of other things to do as well, including the chance to join bear viewing tours, where you’ll visit feeding sites and dens, observing the animals in the wild – sometimes, a mother bear and her cubs will even appear. This is also your chance to experience the heart-pounding thrill of riding a zipline. Not just any zipline, but North America’s longest, the Sasquatch Zipline, which stretches for 1.3 miles, bridging two mountains in Whistler. 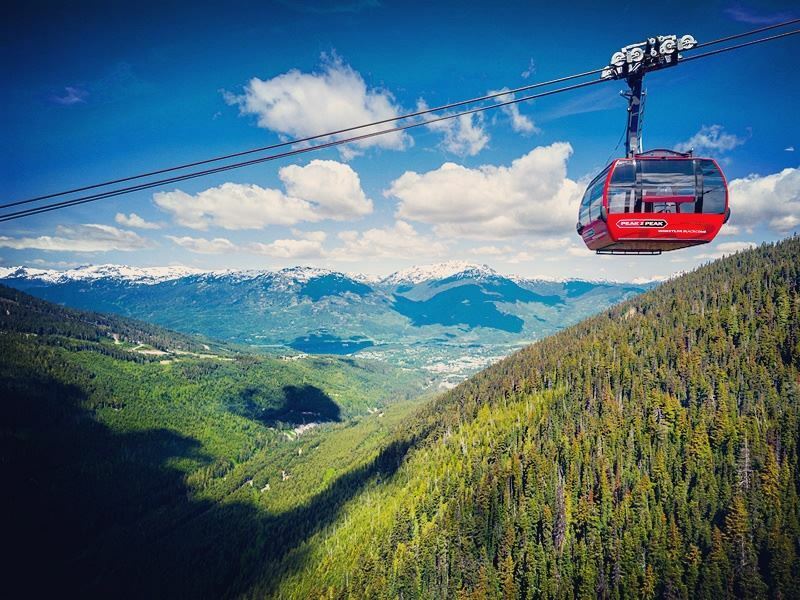 It launches from Blackcomb Mountain, whizzing across the valley to Whistler Mountain, as you soar as high as 600 feet off the ground, almost as if you’re actually flying, through the forest and over streams. Another opportunity for a bird’s-eye view of the landscape is to take a helicopter tour. Some of the longer tours will even take you over Cheakamus Glacier, Black Tusk and Garibaldi Provincial Park. Of course, there are plenty of opportunities for relaxing and outstanding dining experiences too, with some 200 different options, from top-notch pub grub to organic farm-to-table cuisine and fine dining. Want to enjoy the perfectly planned, self-drive itinerary to make your dreams of exploring the British Columbia wilderness a reality? We’ve done all of the planning for you, let us book, and you can start packing.